Jason Robins, the CEO of DraftKings, asks me. We’re side by side, strapped into the front row of a roller coaster inside the Mall of America. I consider lying, and then simply admit I am. “You don’t have to do this,” he says, seeming earnestly to mean it. But as the ride creaks and shudders, it seems a bit late to bow out now. It was the Friday before the Super Bowl, and Minnesota’s most famous shopping center had transformed into a frenzied mini city of media personalities, sports bigwigs, and brand reps. Robins, a youthful 37 with short dark hair, talked fast and walked a little hunched forward, imparting a look of urgency as he circled the premises, gave interviews, and checked in with the talent from DraftKings’ own video operation. So far it had been all business, though I did notice him throughout the morning eyeing the amusement park rides in the mall’s central atrium. He has a thing for roller coasters, so when he finally had a few minutes free and got to choose between lunch and a ride—it was really no decision at all. It strikes me as almost too on the nose that Robins is a roller-coaster-riding thrill junkie (he also likes scary movies and betting big in poker). Despite his genial, deliberate affect, he’s earned a reputation as an über-aggressive, ask-for-forgiveness-not-permission risk-taker—even in the swashbuckling world of startups. The analogy is too apt to ignore. The ride Robins has taken with DraftKings has been alternately exhilarating and terrifying, full of improbable ascents and precipitous falls. He built Boston-based DraftKings—a website and a mobile app through which users can play fantasy sports every day for money—by raising close to a billion dollars and spending it relentlessly battling the company’s archrival, FanDuel, for industry dominance. Surely you remember the ads. During the 2015 NFL season, the two companies saturated the airwaves with commercials promising million-dollar payouts for games that cost only a few bucks to play. Perhaps you recall the scandal, too. The New York Times reported on suspicions of “insider trading” by an employee—and state attorneys general across the country moved to shut the two tech behemoths down. The ensuing crisis nearly tanked the industry as investors’ money dried up and customers abandoned the controversial sites. Robins, always attacking, mounted a nationwide lobbying counteroffensive and pulled DraftKings through. Today, though, Robins and the billion-dollar company he built from scratch are entering a new phase. DraftKings has moved out of a legal gray area and is now officially regulated throughout much of the country. The ruthless war with FanDuel is fading into memory. 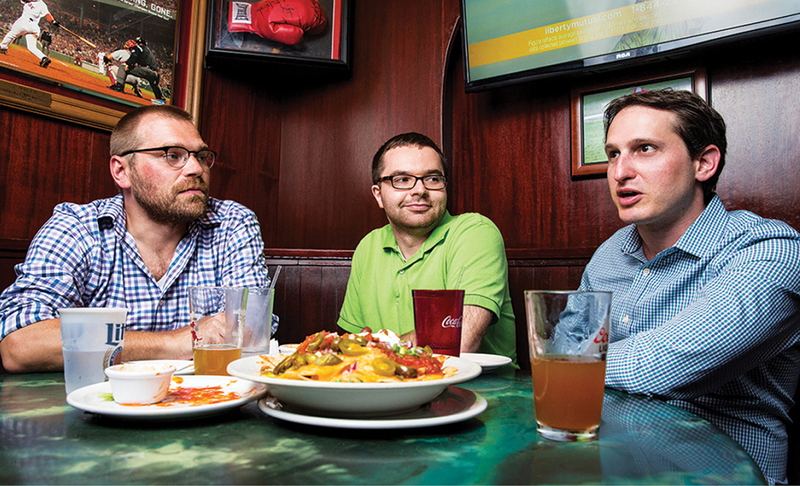 Robins, for the first time in years, is focused not on fighting for survival, but on shaping the future of DraftKings—by some estimates the most valuable private consumer tech startup in Boston. Some of his effort is focused on rehabilitating his company’s image. Particularly at home in Boston, DraftKings’ somewhat out-of-date reputation as a business operating at the limits of legality and morality presents a conundrum. 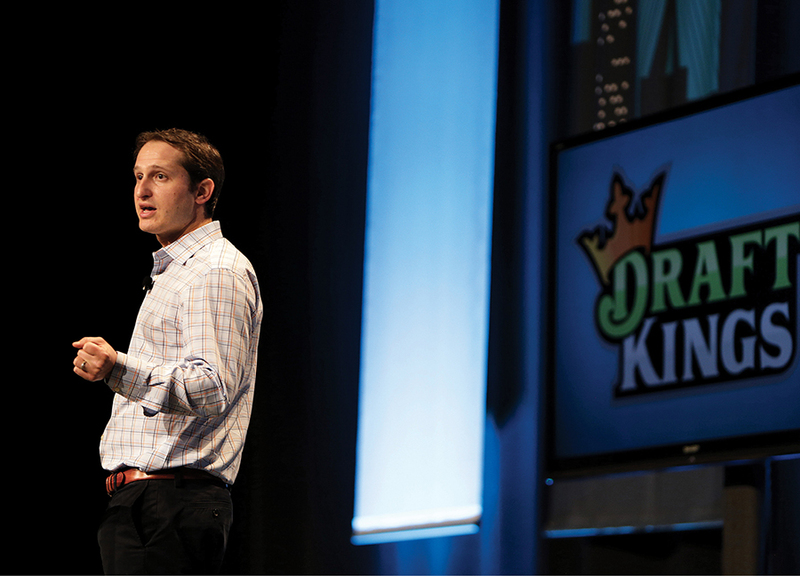 DraftKings’ success story—a homegrown tech company that went from zero to a valuation of more than a billion dollars—has been eclipsed by years of bad press. Robins says daily fantasy is an entertainment product, a “second screen” experience that makes watching sports more fun. Still, in some inescapable ways it resembles an online casino, and plenty of obstacles still loom. If Robins is to succeed as extravagantly in DraftKings’ next act as he did in its first, he will have to convince the city and the worlds of tech and finance that his company is, or can be, something more than just a daily fantasy sports site. Robins’s vision for that future is as audacious as it is ambitious. He imagines a vast media operation, international expansion, and a move into other kinds of fantasy sports and online gambling. He invites comparisons—ones that analysts used to draw routinely—with world-beating tech companies such as Google and Uber. Meanwhile, it is also fair to wonder whether Robins is the right man to lead the company into the future. His critics look at the war he waged with FanDuel—and the fallout it caused—and see a business led by a naive and reckless daredevil who built DraftKings through sheer audacity. His defenders believe Robins is a brilliant tactician who saw that playing to win meant being as aggressive as he could be. The question boils down to this: Is Robins playing chicken, or chess? The answer is likely to determine where DraftKings goes next—and whether Robins will be the man to take it there. If he’s as heedlessly aggressive as he has sometimes been portrayed, he may spend DraftKings into extinction. If he’s the tactician his supporters claim, his company will be well positioned to thrive. In the time I spent with him, Robins seemed undaunted by the past and exhilarated by the future. He also seems, for the first time in years, to be having fun again. Now, as the roller coaster jolts forward and creeps up a nearly vertical ramp, he chats amiably, even though I’ve gone dead silent. At the top, we pause for an instant before plunging toward the floor. I turn my head to see Robins, hair pushed back and giggling with an open-mouthed grin. Looking back, it is astounding that Robins and Eccles were able to raise so much money so fast in light of their industry’s shaky legal foundation. Daily fantasy operated inside a loophole in a 2006 law, the Unlawful Internet Gambling Enforcement Act. The UIGEA was designed as a crackdown on online gambling, but lawmakers had included an exemption for fantasy sports. Eccles had pioneered the argument that the exemption applied to daily fantasy, and neither regulators nor the courts had seriously challenged his interpretation. Robins began making the same argument himself—and from day one built his entire business on this unproven legal theory. Under those circumstances, it might have been prudent to lie low. Instead, believing the industry would prove to be a winner-take-all market, Robins launched an advertising war with FanDuel in 2015 that drew unprecedented attention to the industry. He hired football stars—including Rob Gronkowski and Ronde and Tiki Barber—and Hollywood A-listers such as Edward Norton to shill for DraftKings on TV. DraftKings and FanDuel competed to make the most eye-popping claims about their contests. “Paying out $75 million this week,” a FanDuel commercial blared. DraftKings countered by announcing it expected to award “well over $1 billion in prizes” in 2015. The two companies, according to one estimate, spent more than $260 million on commercials during the 2015 NFL season alone. By that fall, Robins’s gamble seemed to be paying off. DraftKings was serving more than 2 million paying users and processing more than $2 billion of entry fees from its contests per year. Robins’s fundraising and marketing skills were becoming the stuff of tech legend. Not only had he raised hundreds of millions of dollars, but he had brought in a dizzying roster of investors: Jerry Jones, the Kraft Group, Major League Baseball, 21st Century Fox, and Madison Square Garden. Robins, in turn, was anointed tech’s latest golden boy. In October 2015, he landed on the cover of Fortune. “This Man Is Blowing Up Fantasy Sports,” the web headline read. The assessment was, perhaps, more prescient than intended. Robins was at a conference in London during the fall of 2015 for what would become the worst day in DraftKings’ short history. 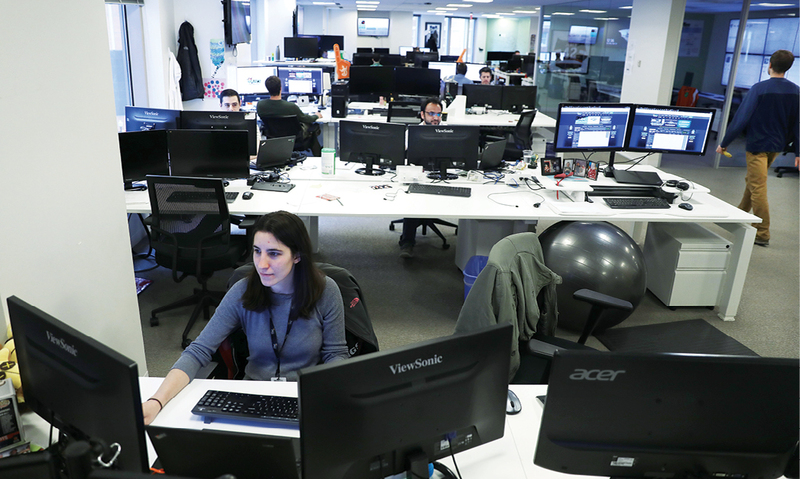 It started with a call from a New York Times reporter who wanted to discuss a minor controversy in the growing daily fantasy world. Robins felt the interview went well. Not long after hanging up the phone, though, he got a text from his communications chief. The story was live and it was a bombshell: The first paragraph included the words “insider trading,” an ominous phrase that raised the specter of criminal prosecution. “I was so naive,” Robins says. The article implied, without quite alleging, that a DraftKings employee had used private, internal data to help him win $350,000 in a contest run by FanDuel. To this day, industry insiders and experts remain deeply skeptical that the case at the center of the study involved foul play, but the article pointed to two significant problems: DraftKings and FanDuel seemed not to have adequate controls in place—despite the billions of dollars passing through their doors—and their employees, who clearly had access to sensitive data, were allowed to play, and win big, on each other’s sites. “In retrospect, I should have known better than to have a policy where employees could play,” Robins says. “I should have known something like this could happen, and we didn’t. I own that, and that was a mistake.” If the lax policies were the gasoline, the Times story was the blowtorch. In the midst of the crisis, Robins’s view of FanDuel changed: He now saw his competitor as a temporary ally. He and Eccles soon agreed to a kind of armistice, together hiring a small army of lawyers, lobbyists, and crisis PR professionals and laying out a nationwide plan to push for industry regulation. The first and biggest win came in Robins’s home state, largely thanks to Massachusetts Attorney General Maura Healey’s more sympathetic stance toward daily fantasy. “I think anybody looking at this acknowledges it’s a form of gambling,” she said. “Just because it’s gambling doesn’t make it illegal.” In January, she issued regulatory guidelines designed to make daily fantasy fairer and more transparent, rather than moving to ban the companies’ operations. Six other states soon followed, passing legislation that adopted some of Healey’s guidelines. Robins and Eccles’s new relationship also showed other signs of paying off. Since early 2015, Robins had seen the strategic sense in combining the two companies and had been proposing a merger. “I saw where this was going,” Robins tells me. “Why keep beating each other’s heads in?” Eccles rebuffed him, but Robins never gave up on the idea. In the spring of 2016, Robins and Eccles met secretly over drinks at a tiny Italian restaurant in Albany, New York. Both men were in town lobbying for legislation that would allow their companies to operate legally, and Robins was afraid even to be seen with Eccles for fear that any scrap of news about the two CEOs could be used against them. “We were very paranoid at the time,” Robins tells me, yet the promise of pulling off a merger outweighed any risks. They sat across from each other in a booth tucked away from the main dining room and spent four hours hashing out terms of a peace deal that only a few years earlier would have been unthinkable. As talks between DraftKings and FanDuel slowly progressed, one stunning development emerged: Robins, not Eccles, would be the CEO of the new entity. Although the FTC eventually blocked the deal on antitrust grounds, it was clear that Robins had replaced Eccles as the industry’s leader. The deal’s failure also marked a turning point in the two companies’ fortunes. “It’s likely that FanDuel desperately needed that merger,” says Daniel Roberts, a sports business reporter at Yahoo Finance. Analysts believe FanDuel is now positioning itself for a sale and, as a result, is spending less and ceding even more market share to DraftKings. Last November, Eccles left the company he founded, solidifying Robins’s position—finally—as the undisputed king of daily fantasy. On Sunday, Robins is putting $2.4 million up for grabs, including a $1 million top prize—for a contest that will last about three hours. It occurs to me that a single-game contest like this might not have fit through the original fantasy sports loophole that DraftKings once relied on. It smacks of being the sort of thing Robins would have done when he was desperately trying to make a name for himself, but isn’t necessary today. Doesn’t that carry legal risks? I ask. “No,” Robins says, smiling. “That’s the nice part about being regulated. The contest has been approved.” Robins, the gunslinger, has gone legit. Meanwhile, DraftKings is expanding. In January, Robins announced plans to move the company from its current office near South Station, where it weathered the crisis of 2015 and 2016, to a new space double the size in the Back Bay. Robins also plans to hire nearly 300 new employees, almost all of them in Boston. The planned hiring spree and move across town come as Robins and DraftKings are entering a new phase. The frenetic pace of recent years has slowed. The advertising war with FanDuel is over, and the hangover it caused makes it unlikely to be repeated. Robins told me in February he hadn’t focused on raising venture-capital funding in a year. In the state-by-state campaign for regulation, Robins keeps notching wins—and mitigating the industry’s legal risks. In January, the Massachusetts Senate began considering an online gaming bill that could permanently legalize daily fantasy and solidify DraftKings’ legal standing in its home state. In a sense, DraftKings is, for the first time, becoming a normal company. Rather than fighting a single adversary for dominance, Robins is now confronting the more mundane issue of market forces. In February, the research firm Eilers & Krejcik Gaming released a bleak report that predicted stagnant growth in the daily fantasy industry. “The potential for growth here is just a lot smaller than people once predicted,” Roberts says. “With the average sports fan, the interest is just not there.” Robins disputes this claim, conceding that growth has slowed but attributing it to the decrease in marketing rather than softening consumer demand. “So much of this, in any case, comes down to what people do,” Robins says, as opposed to a cold, quantitative analysis from a distance. The decisions of a competent and creative CEO, he seems to argue, can drive growth in ways that a report can’t account for. A fair question, though, is whether Robins remains the right man for the job. 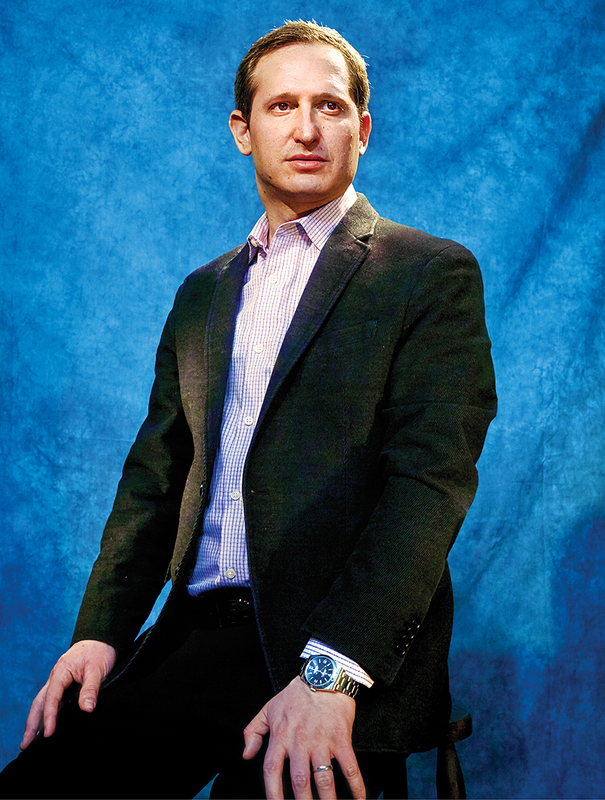 As time passes, the challenges ahead for DraftKings bear less and less resemblance to the ones Robins successfully confronted as he built the company from the ground up. Now that he’s finally on top, should he stay there? On a gray, sleeting day this past winter, I meet Robins at DraftKings’ office in a tower near South Station. The place is decorated with trophies he’s collected: plaques and prizes from Fortune, the Globe, and industry associations; a photo signed to Robins by Malcolm Butler, the Patriots’ Super Bowl hero in 2015; autographed basketballs and footballs. A television is tuned to NBA TV. Robins sits sideways in his chair at the head of a long conference table. There’s something youthful, even childish, about the posture, which seems at odds with his attire: practical slacks, loafers, and a tucked-in button-down. He’s in a mood to think expansively about the future—a state of mind he considers a luxury after a couple of years consumed by the crises of the moment. Whatever daily fantasy’s prospects may be, Robins, in recent months, has showed a different side of himself by laying the groundwork for a strategy to extend DraftKings’ reach beyond its original idea. The future, he says, is tied to the value of DraftKings’ customer data. “We know which customers are fans and which players they like,” he has said. “That helps you understand what apparel to sell them, what tickets they might want.” He also imagines processing transactions for media companies and, with DK Live, creating original content. He is moving into foreign markets as a hedge against stagnation in the U.S. In February, he announced a new hire, a “head of Sportsbook,” to create a sports betting business within DraftKings. Ironically, after years fighting the perception that he ran a gambling business, Robins now wants to be a bookmaker. (That opportunity depends, largely, on the outcome of a case currently before the Supreme Court that could lift a federal prohibition on sports betting.) The picture he paints is of a complex business advancing deliberately on multiple fronts—a far cry from the single-minded organization that, a few years ago, seemed maniacally focused on advertising.